@amour4ever wrote: Another thing that disappointed me, like RobSp1derp1g said, was that all the "good stuff" was shown in the previews, leaving myself and others thinking/hoping that there would be more hints or what have you still to come. That said, XY59 was a positive episode for amour. I have had an optimistic outlook for this ship from the beginning, and continue to do so. Which is surprising for me, since I am overall a pessimistic person. pokesrini, I just want to say how much I admire your upbeat attitude. I won't deny that most of the hints were shown in the preview (most, not all). But that is the reason why you are disappointed. It isn't a disappointment in and of itself. Nevertheless, it is still a lot from a single episode! Moreover, consider the gravity of what we've got. This is the first absolute, incontrovertible confirmation that Serena's crush is still there. After all her development episodes and stuff, there was a fear that her crush may be allowed to die out. Sure there were some of us perpetual optimists who never had that qualm, being satisfied with the small writers' hints here and there. But this is the first confirmation that she still likes him just as much, if not more. It also confirmed to us that Ash is indeed acting different towards her- much more quiet and reserved, compared to the other PokeGirls. Another thing it gave us was that big hint. I love the point that Science brought up about the juxtaposition of the XY007 gift scene with this gift scene. It was literally screaming in front of us, yet most of us didn't notice. Anyway, it isn't always optimism for me. I try to look at things for what they are, at least when we have the episodes in front of us. My speculations may be on the optimistic side of course. I have debunked a fair share of "phantom hints" too. So to try to snap you guys out of this topic, there is speculation that the old lady wearing sunglasses in that car in XY060 may actually be a judge. A very, very strict judge. She probably lambasts Serena's performance to the point that drives Serena into not believing in herself anymore. The sunset scene may see her calling back the AmourShipping motto, "Never give up til' its over" before cutting off her hair (much as I hate that). So yes, that's the one hint I expect to see off XY060. Probably no hints from Ash's side, unless (only) he reassures her that he will support her till the end and/or he blank stares when she performs. Both are not impossible. The first one because if you recollect, when Serena finished registering for the Tripokelon in XY059, she spoke to only Ash. second one because we did see a foreshadowing of that in, I think the year end preview? I was one of those perpetual optimists who had no qualms that Serena's crush was going to die out once she figured out what she wanted to do and started making it happen, but to have it be unmistakably confirmed yet again is always a welcome thing. Ash definitely acts different towards Serena, in a good way, a cute way. I like that they have yet to fight, though should it happen, and I find it hard to believe it won't, I think it will end up bringing them closer together. In regards to the gift, I was initially disappointed it was something Ash didn't buy himself. After reading what fellow amourshippers had to say though, how if he can't figure out what to buy his pokemon, how could he ever figure out what to buy Serena, well, they're right. So now I can smile about it, and take it as a hint, to a degree. I too don't like that Serena is getting a haircut, I love her hair, but I'm hopeful her new 'do will work. Yep that's one thing. On top of it all, I've got some interesting points for you guys raised by ScienceIsSoAmazing. "Well I've been reading some tweets from the Japanese (#satosere was a trending topic there again), apparently for them the episode was incredible, in fact more than one of them was considering Amour to be canon already, and it turns out that Japanese dates are all similar and the gift from Satoshi, it has a name in Japanese (I don't remember right now, sorry), the question is that that gift is referred to in a certain way and is a typical Japanese gift that's given on a date, at the end of it (something like a symbol of gratitude to the girl for believing that it was worth it), but the bad thing for everyone else is that apparently the relationship will be romantic in the Japanese way, it's completely different from ours." Another user in response said that he agreed and that he had been pointing this out numerous times but that nobody paid any attention. He then said that Ash giving Serena a gift on the first date "has immeasurable value for the Japanese" and that it kind of represented a "breakthrough" moment. He didn't explain why it was a "breakthrough" (I'm skeptical of that point), but he did suggest that in Japan it's unusual enough for a couple to hold hands on the first date, and even more unusual for someone to give a gift on the first date. Of course, even if this is all true, I'm not sure how significant it is. It's not like Ash was thinking of this as a date (I mean c'mon, he's a shonen idiot hero, and we simply can't expect him to be the lovey dovey type). But he was doing the whole nose-scratching thing, suggesting he was nervous. And even if "date" wasn't on his mind at the moment, the simple act of giving a gift to her might have effectively made the whole episode a date from a symbolic point of view, regardless of what he was intending there. Maybe that's why Serena got so excited to receive something as simple as a roll of blue painters' tape blue ribbon as a gift; maybe the gift signified to her that this was, at least symbolically, something of a date after all, not by design but by freak consequence. That was a PM he sent me. And I will add that I hung out in YouTube and some other places where the gist of the comments of some Japanese was, "I don't understand what you guys are complaining about. The episode was terrific!" some of them even went to the extent of calling it canon. Now while I think that calling it canon may have been a bit of a stretch, it does seem like this episode was very rich in deep symbolism. I guess this was a sudden and unexpected source of optimism for those AmourShippers who seemed rather down in the dumps after the episode. Looks like this also sort of helps me push my Pacific Rim type love-story theory. No blatant romance, but deep, deep trust and support, and a very strong bond. And if you ask me, it is an equally beautiful story. @pokesrini wrote: Yep that's one thing. On top of it all, I've got some interesting points for you guys raised by ScienceIsSoAmazing. Some additional context from the second poster (the guy who responded to the first one)...Later, addressing another question, that second user added: "Evidentemente es un hint, lo trate de decir en un mensaje anterior, para los japoneses el dar un regalo a una chica sin tener una relación familiar es algo muy raro, además es un regalo, no una fruta ni una flor ni nada así, como ya han comentado el dar un regalo de ese tipo al final de una cita en Japón significa mucho, por eso los japoneses están tan contentos con el capitulo." Translated to English: "Evidently it's a hint, I tried to say that in a previous post, for the Japanese giving a gift to a girl without being close to her is something very unusual, not to mention it's a gift (as opposed to something else), not a fruit or flower or anything like that, as they have already commented giving a gift like this at the end of a date in Japan means a lot, for that reason the Japanese are really happy with the episode." Clemontic gear: Giving Ash sciencegasms since 2013...and providing the most infuriating running gag Pokemon has seen (except maybe Bianca's water gag). And na matter how we will look at it overrules everything. If in japan this moment is fully considered as a hint we're in no position to argue with it. USA, Poland, UK. No matter which country we live, we cannot apply our culture without wondering, what this means in Japan. If japanese amour supporter are satisfied, that's enough for me. She has BLUE RIBBON on her new cloth. Great job pK. I knew you will be very helpful. So mistery what will happen to that blue ribbon from Ash looks solved. The only question is. What will trigger that change? Lost Showcase, Ash or both. I think her old outfit looks better. But how will Ash react to this one? Since this isn't the right thread to talk about XY060 in its entirety, there'll be a seperate thread for that. Blue ribbon indeed is one that Satoshi gave her. 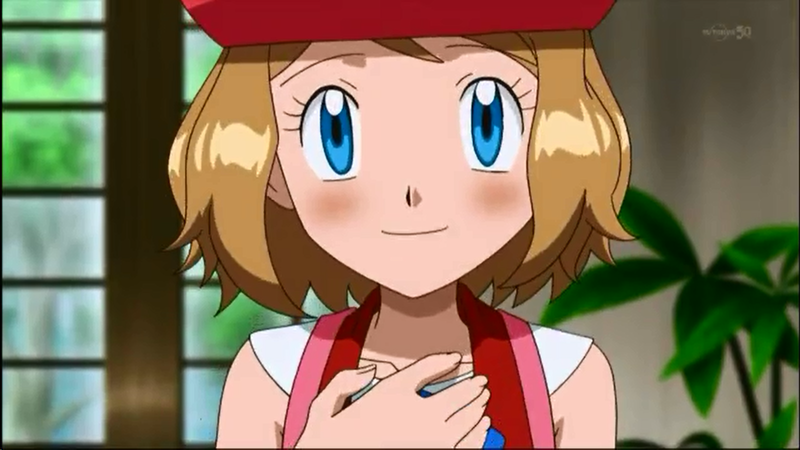 When Satoshi asked Serena about the ribbon, Serena blushies and tells him that its one that he gave to her as present. Excuse me. I need to go to IKEA to flip some more tables. Another thing. WHY does such a hint-heavy episode have to come when I cannot watch it?! I have a bloody midterm tomorrow. Anyway, I am happy and sad. Happy because there were some very, very good hints. Sad because of the redesign. I reiterate my stand now that she looks better with longer hair. At least to the length of her midriff. But I can deal with this. It isn't that bad as we initially thought, and I don't think it will stay this way forever. Never thought someone cutting their hair could be so emotional! While I loved Serena's long hair, I think she looks really cute with short hair too. I also like her new outfit, especially a certain blue ribbon, which Ash took notice of, that made me so freaking happy. Given the fact that Serena will be sporting her new wardrobe for an undetermined amount of time, this will be a recurring hint that will be seen in subsequent future episodes. It's like as if to frequently remind us viewers that not only is her one-sided crush for Ash still alive, but also to frequently remind viewers that Ash will always be there for Serena no matter what. And in my opinion, that's a BFD. Both XY059 and XY060 was indeed a huge turning point for the ship - there's no going back now. It's here, and it'll be here to stay for good. If we do have times where we have hint droughts later down the line, just remind yourself that the ribbon's there - for every single episode from now on. It's a recurring hint, and it will always be there. Until she changes her wardrobe later on ._. Serena's design is a bit 'meh' IMHO, but I like the fact that Ash's ribbon will always be with her, which is quite possibly the biggest hint we've ever received. IIRC this is the first time anyone's added a gift from someone to their redesign. I agree with BloodRed here. The design isn't a world beater, and it certainly won't have me screaming in favour. But I don't mind it for the medium term. As such, I hold my speculation that we will probably see gradual regrowth. So it won't be too bad. And yes. It is the biggest hint we have ever received, from both sides, and the writers! Anyway, I haven't watched the episode yet but the AmourShipping hint is pretty heavy from what it seems. If Serena gets some really good character development like this throughout the series; it would be much more likely that she will travel with Ash to Gen 7. The Lord and Saviour of AmourShipping. I'm writing a huge post on Serebii about her redesign. Be ready for funny moments. @RobSp1derp1g wrote: I'm writing a huge post on Serebii about her redesign. Be ready for funny moments. One thing I like about Serena's side of AmourShipping is that it's not just some silly crush that the OtherShippers make it out to be. The hints we get in episodes like this are generally serious and go along with Serena goal and character development. I can understand why. The hints we got out of this were massive! On top of all that, we got Ash hints! Of all things, hints from Ash! I think AmourShippers are in for some good times. Btw Rob, looking forward to that post. I, however think that this might be the beginning of a small hint drought, at least till probably XY064, or maybe even the Lumiose Gym. We have gotten so much in the past few episodes that I feel that we really can't keep this up! @pokesrini wrote: I, however think that this might be the beginning of a small hint drought, at least till probably XY064, or maybe even the Lumiose Gym. We have gotten so much in the past few episodes that I feel that we really can't keep this up! We've been so spoiled the last 2 episodes, that I feel the same way too. RobSp1derp1g, we both seem to love Serena's new look. I never expected this to happen, but it would've been so cute if right after Ash saw Serena with short hair, that he had a flashback to when they first met and she had short hair. You know, now that I've seen the episode, I really like the new design (though the original will always be my favourite). I can't believe that the writers really made her wear the blue ribbon. She is literally wearing a symbol of AmourShipping, possibly to remind us that they haven't forgotten about Amour when we are in another drought. Interesting how they squeezed that hint into there, wearing it all the time is much better than her just wearing it for her performance. @PotSmuggle wrote: You know, now that I've seen the episode, I really like the new design (though the original will always be my favourite). Also, the flood of post-XY060 fanart that came pouring in after the episode aired. I'm amazed at how fast some of these people can draw these in such a short amount of time. Given the fact that Serena will be wearing her new outfit for quite some time, the ribbon on her outfit will serve as a recurring hint, and thus will be in every future episode for an undetermined amount of time. It's like as if to frequently remind us viewers that not only is her one-sided crush for Ash still alive, but also to frequently remind us viewers that Ash will always be there to support Serena no matter what. And in my opinion, that's a BFD, especially on Ash's side. In retrospect, both XY059 and XY060 served as a huge turning point for the ship - there's no going back now. Those episodes solidly cemented the ship for good, making it a visible (if not important) part of the XY series. Serena's brave act to cut her hair (no doubt partially inspired by the fact the ribbon she put on Fennekin for the TriPokalon tournament was a bit too long, leading to her unfortunate early exit from the tournament), combined with the brief, yet flashbacks of the past, symbolized her passionate desire to cut out everything that represented who she was in her past: her insecurities, her shyness, her doubts, her lack of goal/direction (in the beginning), her fears, her self-consiciousness. Along with the haircut, Serena's decision to change into a new outfit symbolizes her shedding her self-consiciousness and gaining newfound confidence in herself (In a metaphorical sense, she has broken out of her sheltered cocoon and became a free butterfly with no boundaries to worry about). She has now turned a page from her past and is now starting fresh on a new page - where she will begin to write define her own journey from that point on in her own terms. And to top everything off, setting the emotional scene during a sunrise is also significantly symbolic on its own. 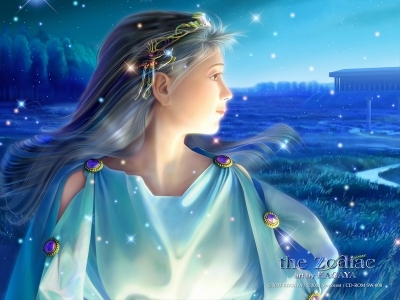 It symbolizes the dawn (yes shoot me lol), rebirth, etc of the new, yet deeply determined Serena. With her transformation now complete, she is ready to take on any challenges, doubts, fears that will be thrown in her path along the way. ^ In other words, it's going to be more likely that Serena will let out her feelings for Ash and perhaps confess later down the road. I can't wait to see how much development she got as a result, and how it will help her win the next Tri-Pokalon. So far, we haven't got to see much improvements for this "new" Serena except for her confidence.